The work within the subtask C “Market support measures” is related to create a panel of measures to support the solar cooling market. These measures will use the results of Subtasks A “Quality procedure on component level” and B “Quality procedure on system level” and will above all explore the possibilities to identify, rate and verify the quality and performance of solar cooling solutions. The resulting tools are intended to provide a framework that will enable policy makers to craft suitable interventions (e.g. certificates, label and contracting etc.) that will support solar cooling on a level playing field with other renewable energy technologies. Even if the completion of these tools will not be achieved rapidly, the subtask should permit to initiate all and maybe conclude some of them. From the past and present experience with labelling of solar systems (e.g. Solar Keymark, Blauer Engel, etc.) 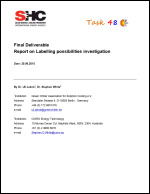 or “Green quality” labels such as LEED or Green Building Council tools, within the framework of Activity C5 “Labelling possibilities investigation”, existing labels as well as different standards for solar cooling and sorption heat pumps were investigated to create a Solar cooling label itself or (more probable) a specific Solar cooling extension(s) to the existing labels. This activity has mainly exploratory and firstly make a full state of the art of the labelling process, which could welcome the solar cooling technology on their scope. From these information’s, investigations on how to integrate them or even how to create an independent Solar Cooling Label were investigated and theorized if accurate. 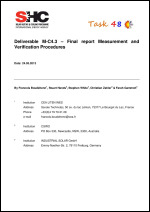 While Measurement & Verification (M&V) procedures (e.g. IPMVP, ASHRAE and FEMP) exist for general energy conservation measures, it is desirable to have a more specific and targeted guide for solar cooling in order to simplify procedures, improve confidence in results and to assist M&V implementation with more detailed guidance. 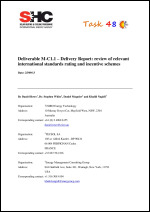 The resulting in-situ and ex-situ measurement procedures have been written up as a document suitable for submission as a draft standard. 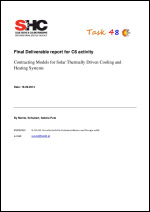 The present final deliverable is a monitoring procedure and a draft standard integrating the following aspects: - Presentation of a generic scheme for solar cooling installations; - Definition of one (or two maximum) performance indicators, with associated calculation method applied to the generic scheme; - Prescription of the sensors required (position, technologies, …) in order to obtain the needed information for calculating the performance indicator(s); - Definition of the analysis method for reporting the performance and quality of the installation. A large number of government incentive programmes and industry development programmes have been instituted in different jurisdictions, to assist the renewable energy and building energy efficiency industries. These programmes call up procedures for quantifying benefits, rating effectiveness and achieving robust measurement and verification. A database of relevant standards, processes and incentives has been created and links to the needs of the solar heating and cooling industry have been analysed.